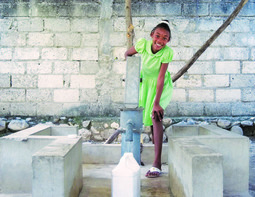 The Haiti Water Project, through Nazarene Compassionate Ministries and local Nazarene churches, aims to provide clean, safe water for communities in Haiti. The goal is to create sustainable, potable water resources that equip local churches to meet the needs around them. One well, or equivalent water source, can provide fresh water for around 1,000 people. With more than 500 Nazarene churches in Haiti, we are well positioned to contribute to the transformation of living standards for thousands of people. The statistics are overwhelming. Approximately half of Haiti’s population lacks access to safe drinking water, and one in every eight children won’t reach their 5th birthday. Providing WASH (Water, Sanitation, and Hygiene) services is a practical way to improve health and well-being and to demonstrate the love of Christ through compassionate ministries. The project has a strategic plan to reach out to many more people in Haiti through local churches. The estimated cost of addressing Water, Sanitation, and Hygiene issues to improve the health and well-being of a particular community in Haiti is $8,500 to $10,000 USD. This cost will help to provide safe water supply by developing available water resources in the community, promoting safe sanitation practices, and encouraging hygienic practices among the communities. In this way, the church becomes an agent of transformation within a community. Your contribution of any amount will help to effectively serve those living without adequate access to safe water and sanitation. Be sure to put ACM1365 in the Memo area. Thanks for your donation.